Sadly, as we all know, Arturo “Thunder” Gatti passed away five years ago next week (July 11th). This special – very special – fighter gave his all in the ring too many time to remember. Yet no-one will ever forget Gatti; least of all his millions of fans and those men who had the honor of meeting him in the ring. WU12 Tracy Harris Patterson, Dec. 1995 – Gatti’s first world title winning fight and one of his first classics. WU12 Patterson, Feb. 1997 – the rematch. WTKO5 Gabriel Ruelas, Oct. 1997 – an awesome slugfest with a stunning ending. LS10 Ivan Robinson, Aug. 1998 – Gatti lost this one, and the return, but he sure gave his all in providing some of his most mesmerising action. WU10 Ward and WU10 Ward, Nov. 2002 and Jun. 2003 – Putting way more than just the finishing touches to this once-in-a-lifetime trilogy. Gatti won world titles at super-featherweight and light-welterweight and he took part in a number of Fights Of The Year. Another tribute Gatti is perhaps deserving of, is a movie of his life story being made. Like his many great fights, who wouldn’t want to see this? “The Fighter” pays a great tribute to Gatti’s fiercest and most celebrated rival, in Mickey Ward; so why shouldn’t Arturo get the celluloid treatment? Speaking of Gatti’s ring rivals, I had the opportunity to speak with three fabulous fighters that shared the ring with Gatti and gave us fans a fantastic fight in the process. Angel Manfredy, who defeated Gatti via 8th-round TKO in January of 1998. Alfonso Gomez was the last man to fight Gatti, beating him via 7th-round TKO in July of 2007. Gabriel Ruelas was stopped by Gatti via 5th-round TKO in an amazing battle that took place in October of 1997. “Arturo Gatti was one of the hardest punchers I ever fought. I think only Azumah Nelson hit harder,” Gabriel recalls. “Gatti gave me my toughest fight though. We went back and forth! I hit the canvas and the referee stopped it – too quickly I believe. I always wanted a rematch. But it was definitely a great fight and I fought Gatti in his “house” (in Atlantic City). 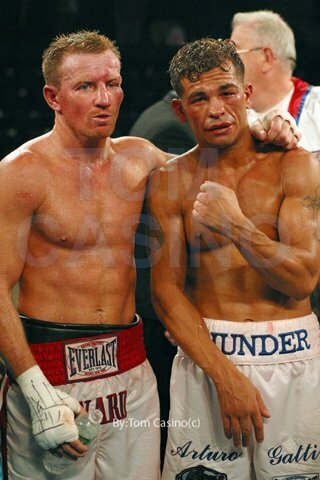 The tributes will continue to come in for Arturo Gatti for as long as the sport of boxing has fans.